In this window you can change the Desktop Calendar cells options. In the preview area you can see the cells preview. Here you can see all changes before apply the options. Cell Skin - when this option is turned on, the cells will be drawed using the program skins (Color Schemes). If the "Use program skin" is selected - cells will be changed automatically when you will change the program Color Schemes. Also you can select any skin manually. Cell Image - here you can select any comes with the program or own image, which will be used as a cell background. Cell Color - allows to set up any cell color instead of background picture. Show week numbers - allow to hide or show week numbers on desktop calendar. Cell Spacing - calendar cells spacing. Cell Border - calendar cells border size (this options is disabled if the "Cell Skin" is turned on). Cell Transparency (%) - cell transparency in percents. Border Transparency (%) - cell borders transparency in percents (this options is disabled if the "Cell Skin" is turned on). Draw Shadows - when this option is turned on, the cells will be drawed with shadows. This option is disabled when the "Cell Skin" is turned on. Horizontal Offset - horizontal shadow offset. Vertical Offset - vertical shadow offset. 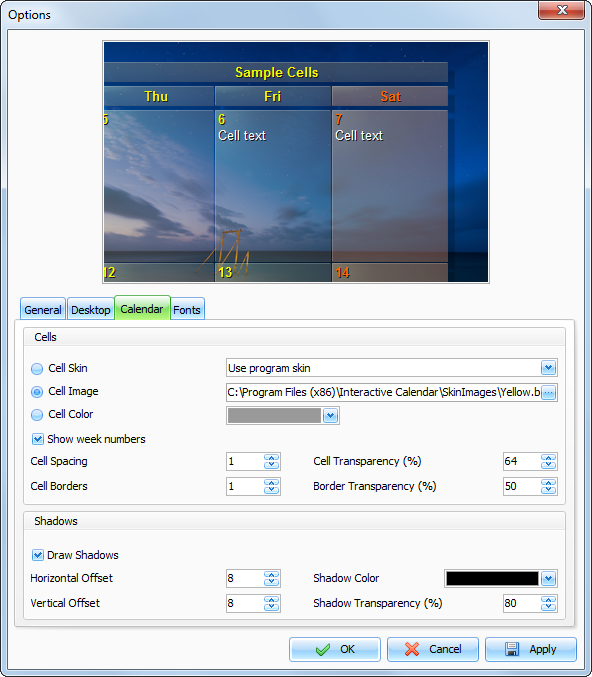 Shadow Color - here you can choose any color for the cells shadow. Shadow Transparency (%) - shadow transparency in percents.